This 2017 we have re-released this Facebook Page Like Popup with lightbox & now easier to install with Blogger widget installer. Stripped out the fatness, blends in on any Blogger themes, easy to customize -- with only a click of a button. Find all the details here at 2017 Facebook Page Like Lightbox documentation page. Installing a Facebook popup "Like" box has been one of the popular features amongst blog users and website owners, ever since the social media websites like Facebook became viral. Surprisingly, our friends and blog shop / web store owners are having hard time installing this social media plug-in, even though it is being widely shared by bloggers alike. Outdated codes and plug-in snippets. Unusable and some triggered browser error. Hangs a webpage due to source code error. Web page loads too slow. Not in full control, some users feels that they are being harrassed by popups! Hard to view (or some do not work) on mobile devices. Updated: Here's an example website using the lightweight responsive Facebook popup Like box with minimal styling. http://www.artienatasha.com . Nice pinkish colors. You could always refresh our page here to see the popup Like box in action. It does not obstruct your webpage load. Responsive and workable in major mobile devices web browsers (tested Android). Set the cookie timer upon visitors first visit. Before we continue, you must have the Jquery library included in your template. Go to Template Editor > Backup/Restore (if required) > Edit HTML > and find this piece of code (or something similar) somewhere in between your <head> and </head> tag. Click Save > and head over to your Blogger Dashboard Layout section. Current setting is 3 days. To test, change the integer to "0" (without quotes). Leave the widget title empty! Save your widget. Drag and drop the widget somewhere at the bottom of your template Layout section. Click Save Arrangements. 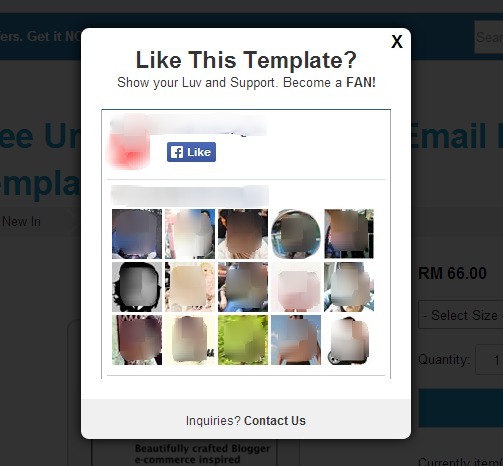 This is to make sure your Facebook Like box popup loads/initiates after any other importat content in your template. You can view the FB popup plug-in. But wait!... Most likely when you open up your web page or blog, your browser had already stored your website or blog informations! View your site by using an Incognito window feature (like in Chrome) or a Private Browsing feature which does not store/save a webpage cookies or cache. Set the timer to "0" (without quotes) at the codes stated above. Clear entirely your browser cache by hitting the CTRL + F5 simultaneously or use the browser Settings > Clear Cache. We also included indicators/comments in the code snippets for you to style and edit the text at your new Facebook popup Like box plug-in. REFRESH this page and don't forget to Like us and become a Fan. Thank you for your support! Need your Luv & Support.